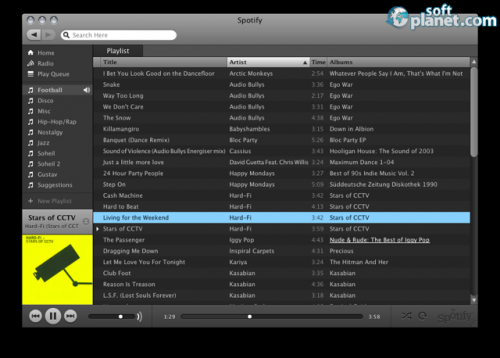 SoftPlanet makes it possible for everyone to get free Spotify download directly from our servers. There is no registration needed for downloading. Spotify is a proper OS X application, which enables people to enjoy their best-loved music right on their Mac OS X machines. It is absolutely free, so now you don't need to pay for songs you like in order to listen to them. It comes with a great interface, which provides you with proper user experience. Spotify version 0.9.6.72 provides access to approximately 20 million songs, which you can search by artist, title, label and genre. It allows you to import music from iTunes as well, using the mobile device sync functionality. 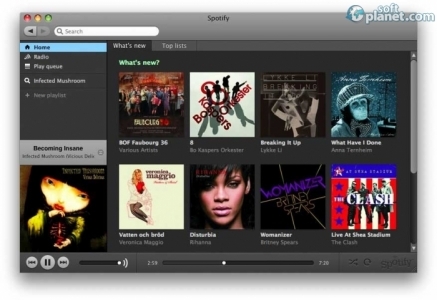 You are also able to create and share playlists and even edit them together with your friends or other Spotify users. This app comes with a feature called Radio, which basically generates random playlists based on particular genres. Spotify enables you to integrate 3rd party applications like Last.fm as well. For instance, you can send songs from Spotify 0.9.6.72 to your Last.fm account easily. The application even allows you to check the biography of a particular artist as well. This software program has just an outstanding interface. You can reorganize it if you want. However the developers have tried their best to provide you with optimized work space. All songs come with an image of the album cover or artist. The playlist field takes a central position within the main window. It contains information like Track, Artist, Time, Popularity and Album. On top you will see a search field and Previous and Next buttons, whose main purpose is to ease your navigation. Like most music streaming applications Spotify comes with a basic control panel, volume bar, timeline, etc. The app works just fine. There are not major bugs. However please be aware that it is not available for all users around the world. Spotify is accessible in the USA, Argentina, Australia, Austria, Belgium, Denmark, Estonia, Finland, France, Germany, Greece, Italy, Poland, Portugal, etc. Please check whether your country is one of these ones. Spotify 0.9.6.72 is a very nice must-have software program especially if you are a big music fan. It is extremely easy to work with and convenient as well. Please check its geographical availability and if it is available in your country, don't hesitate and download it. Thus you can enjoy your favorite music 24/7. Our security scan shows that Spotify is clean from viruses. The current version of Spotify has been scanned by our system, which contains 46 different anti-virus algorithms. That ensures that Spotify 0.9.6.72 is 100% safe for your computer.